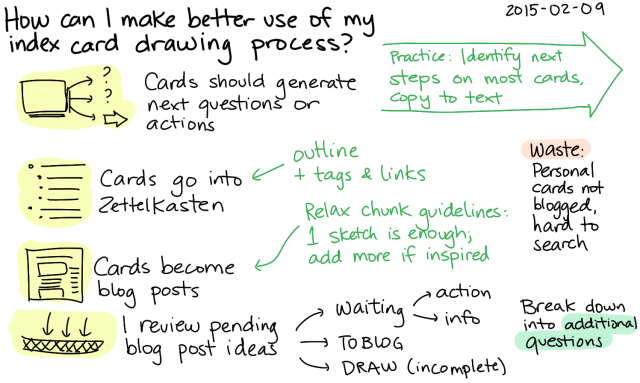 How can I make better use of my index card drawing process? 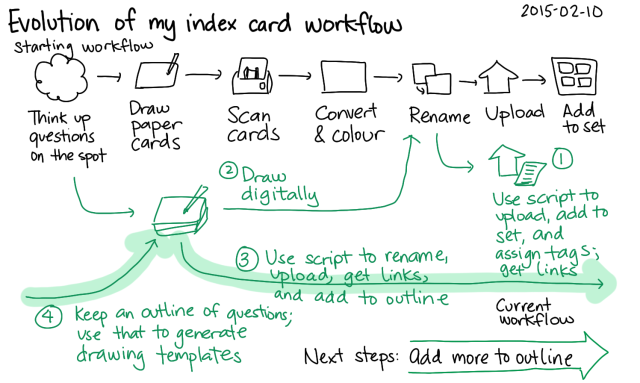 I really like this practice of working with index cards, especially now that I’ve sorted out a sweet digital workflow for them. Draw it on a paper index card. After I complete 5+ index cards, scan the cards. Convert and process the cards (colouring, etc.). Add them to my Flickr set (and to blog posts and so on). I use Org Mode in Emacs to collect and organize questions. I use TODO states to track ones that need further research, ones that are ready to be drawn, and ones that are ready to be blogged. 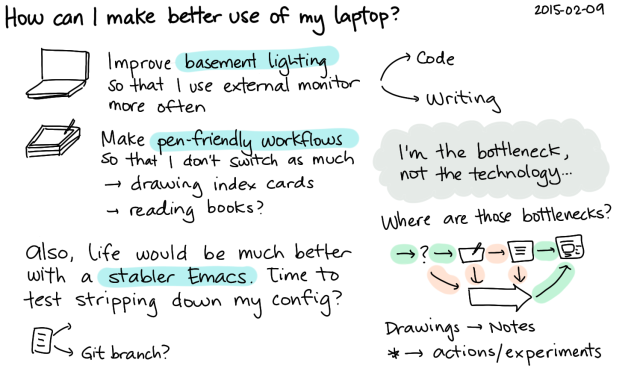 When I switch to tablet mode, I can select questions to draw using a custom pen-friendly Emacs interface that sets up the template for me. I upload the images using another script and add the links to my outline. After I draft the blog post, I use another bit of code to move the relevant images out of my “To blog” directory and into another directory so that I can easily upload them (since I still haven’t tweaked the all-Emacs way of doing things the way I want them). Hmm… Should I add a unique identifier to sketches so that I can refer to them more concisely than giving the full link? This mostly matters for referring to sketches in the drawing itself, since I can use links in text or metadata. For example, I can assign codes to each chunk, possibly differentiating between sketches (letters?) and blog posts (numbers?). So, maybe “2015-01-01a” for the first sketch on January 1, and “2015-01-01-1” for the first blog post? I could omit the dashes, but then searching requires that mental translation, so we’ll keep the dashes in there. The downside is that there’ll be a little additional clutter, but it might be interesting to experiment with – adding a reference line, and maybe even adding the info to the filename. It gives some linking capability that can survive the disparate systems I publish sketches to (my blog, Evernote, Flickr), even for sketches that don’t get turned into blog posts. What about my 5-cards-a-day target? Sometimes making five cards feels like a stretch, since I have to Think Interesting Thoughts. 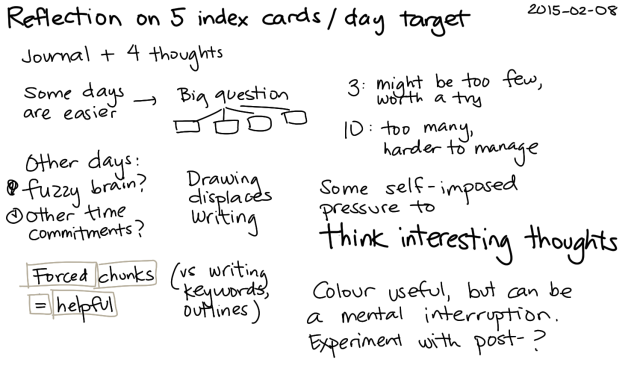 Using templates can help – I could make four cards and a journal entry, for example. I expect the awkwardness will subside as I build up my question store and do more research/experimentation. Colour slows me down if I think about it too much or worry about becoming too repetitive. It might be fine to just quickly highlight things most of the time and save the development of colour sense for sessions of deliberate practice. In terms of thinking, spending the extra few minutes to think about and capture the next questions or actions for a card can make a big difference in my focus. I can also relax my chunking guidelines so that a single sketch can be fleshed out into a quick blog post instead of waiting until I accumulate several sketches related to the topic – taking my own advice to schedule Minimum Viable Posts. If I phrase my outline in terms of questions instead of keywords, I’ll probably find that more motivating and easier to scope.